After completing the summer field season, the 2016 cohort went their separate ways, but continued their summer research, building towards the American Geophysical Union's Fall Meeting in early December where they presented their work. Half of our 2016 cohort of 32 made the trek to San Francisco to present, expand their scientific understanding and connections, and enjoy a number of gatherings with JIRP alumni and faculty. 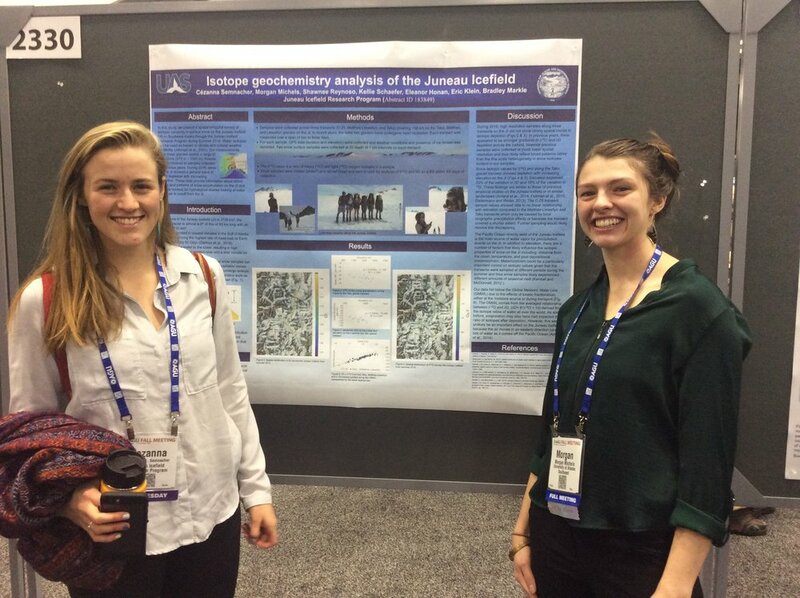 Engaging once again with this talented group of young scientists, introducing them to the larger JIRP family of alumni and faculty, and helping them make connections on their career paths was a real highlight of AGU 2016. The JIRP team is proud of your work and we are excited to build upon these efforts with JIRP's 2017 students! BIOGEOCHEMISTRY: Team members Annie Holt, Annie Zaccarin, Auri Clark and Molly Peek (left to right in image below), present their group's work. Abstract: Previous work has characterized chemical weathering in polar, polythermal, and alpine settings. 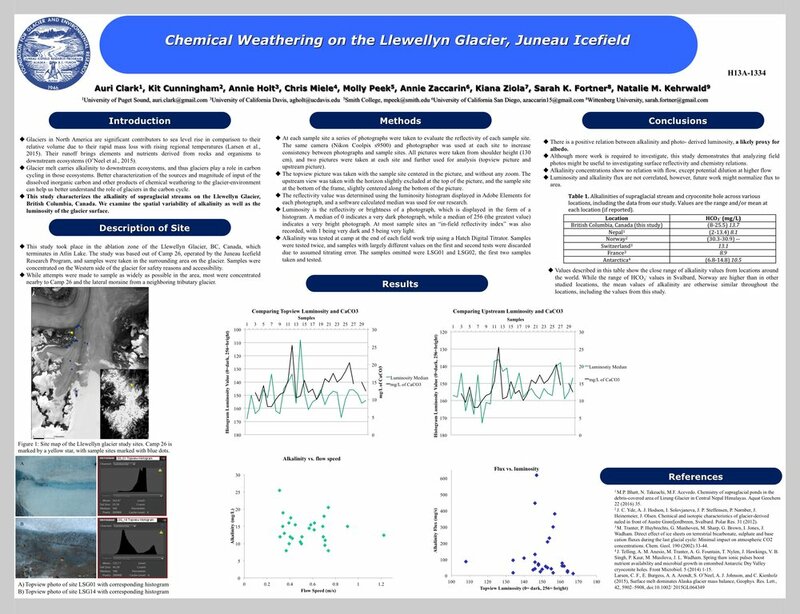 However, chemical weathering and the role of supraglacial streams within the carbon cycle on the Juneau Icefield glacial system is not well documented. This study examines the concentration and spatial variability of alkalinity and major ions present in the ablation zone of the Llewellyn glacier, which is on the northeast side of the Icefield in Canada. In particular, we explore how differences in chemistry are associated with source area reflectivity. By conducting measurements to characterize melt chemistry and alkalinity, we present results of a spatial variation survey of the Llewellyn Glacier ablation zone and relate the findings to surface albedo. We sample 30 locations in August 2016 during the late ablation season using a Hach digital titrator, ion chromatograph and an albedometer to measure alkalinity, major ion concentrations and albedo respectively. We characterize the relation between alkalinity concentrations and dust patterns and compare our data to other glacial systems. This study contributes to the larger understanding of chemical weathering in glacial environments. BOTANY/ECOLOGY: Deirdre Collins presents her team's work. Abstract: Alpine environments are particularly vulnerable to climate change, and alpine plant populations of the Juneau Icefield are currently experiencing increased environmental stress. 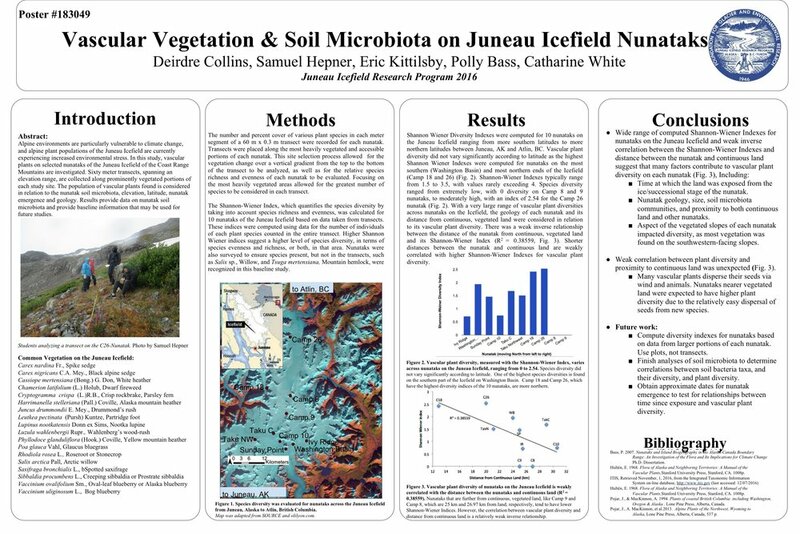 In this study, vascular plants on selected nunataks of the Juneau Icefield of the Coast Range Mountains are investigated. Sixty meter transects spanning an elevation range are collected along prominently vegetated portions of each study site. The population of vascular plants found is considered in relation to the nunatak soil microbiota, elevation, latitude, nunatak emergence and geology. Results indicate previously unknown variations in nunatak soil microbiota and provide baseline data that may be used for future studies. 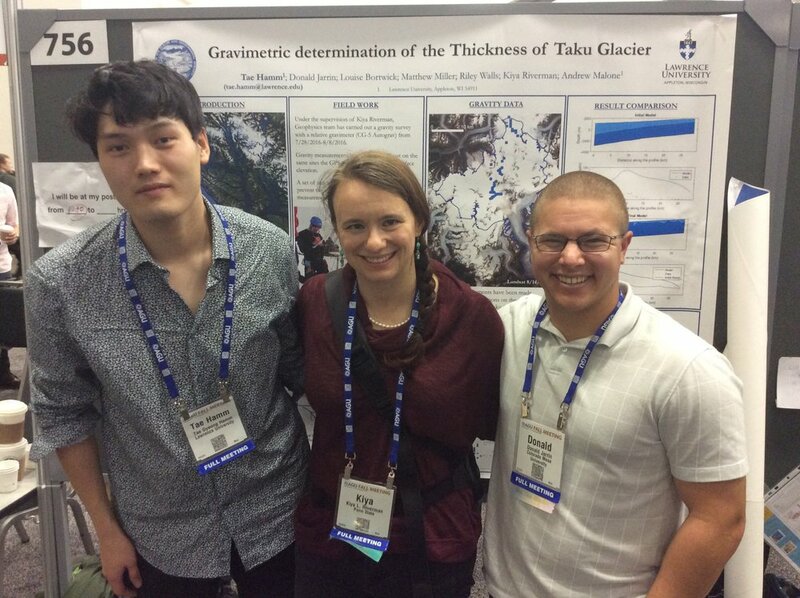 GEOPHYSICS: Tae Hamm, Dr. Kiya Riverman and DJ Jarrin present the geophysics team's 2016 research. Abstract: High resolution measurements of spatial ice thickness variability on the Juneau Icefield are critical to an understanding of current glacial dynamics in the Coast Mountains of Southeast Alaska. In particular, such data are lacking on the Taku Glacier, a tidewater glacier in the Juneau region whose unique advance has slowed in recent years. Significantly, such information is necessary to develop an accurate description of ice dynamics as well as sub-surface hydrology and bedrock erosion. Utilizing relative gravimetry, we sought to modify existing parameterized models of ice thickness with field measurements taken along the centerline of the Taku. Here we present a three-dimensional representation of ice thickness for the Taku, based on in situ observations from July 2016. As the glacier approaches a potential period of rapid terminal retreat, this data gives refined physical information prior to this potential juncture in the tidewater cycle-an observation that may yield insight into marine ice sheet instabilities more broadly. GPS SURVEY: Brittany Ooman (with the assistance of DJ Jarrin) presents the survey team's work from 2016. Abstract: Glaciers are retreating at unprecedented rates worldwide, but the Taku Glacier in Southeast Alaska underwent a recent advance. As part of the Juneau Icefield Research Program, glacier surface elevation and short-term velocity are measured annually during the summer season along longitudinal and transverse profiles using a real time kinematic global positioning system (GPS). We compared our survey results from 2016 to those of recent decades to determine changes in surface elevation and velocity over time. The observed changes are discussed in relation to the available bed topography data. In addition, we generated a detailed surface model and measured the pattern of local surface flow to constrain the location of the Matthes-Llewellyn divide, and determine if it is migrating through time. 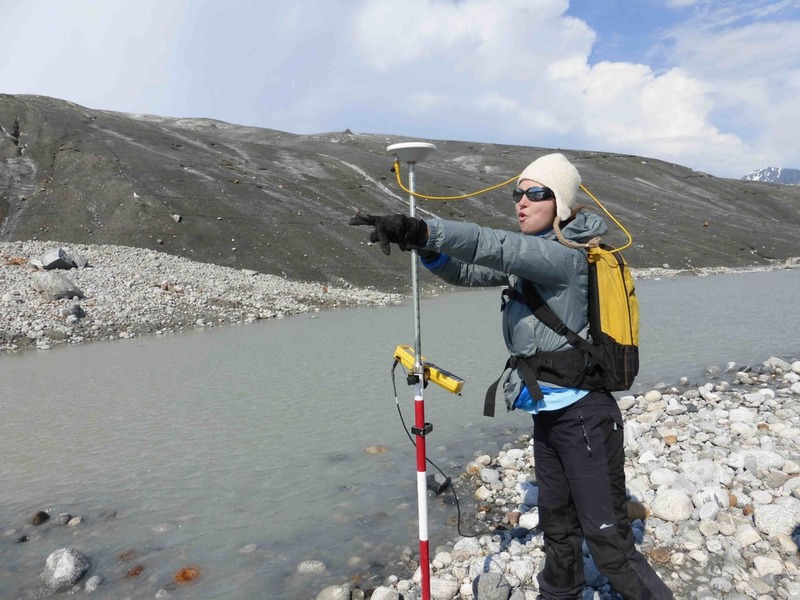 The results will help us understand the evolving dynamics of Taku glacier. ISOTOPE GEOCHEMISTRY: Cezy Semnacher and Mo Michels present the 2016 efforts of the JIRP isotope team. Abstract: The glaciers and climate of Southeast Alaska are currently changing, and the water isotopic record stored within these glaciers can act as an informant of this variability. Toward this end, it is necessary to understand the modern relationship between environmental factors and the patterns of water isotope variability. In this study, we present a spatio-temporal survey of water isotopes in precipitation on the Juneau Icefield of Southeast Alaska, carried out through the Juneau Icefield Research Program during the summer of 2016. Samples were collected from 75 kilometers of surface transects, seven pits, and three cores of the annual snow pack, including repeat measurements to test for isotopic alteration from rainfall events. Measurements span three glaciers, a range of elevations, and multiple climate zones. Results, including those from annually repeated surface transects, were compared to data collected in the summers of 2012 and 2015. Data from 2015 show an icefield-wide trend between δ18O values and elevation. 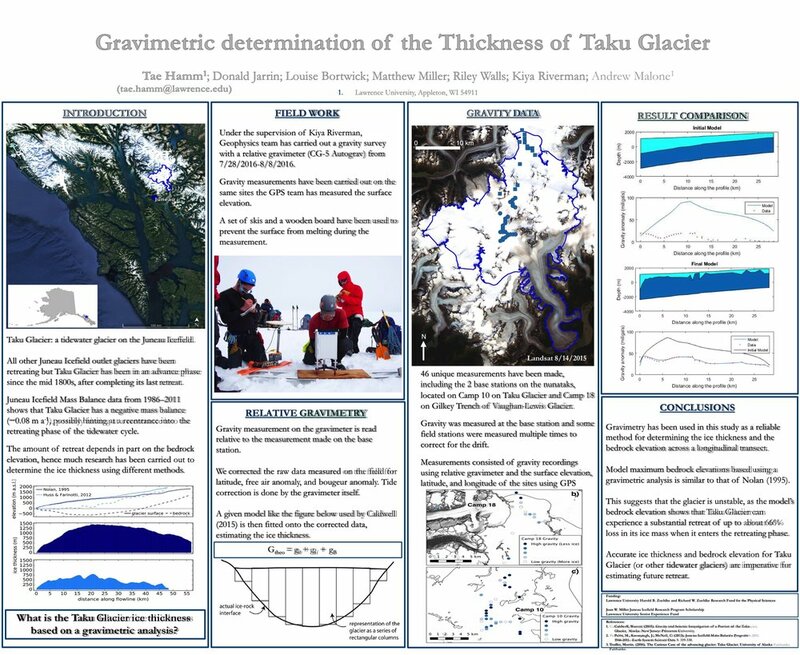 However, a locally reversed trend was identified across the Taku Glacier. The data collected from this study will help to explain this unexpected result. Comparisons are made to other environmental factors including annual average temperature, distance from the coast, and the influence of different weather patterns. Understanding the spatial and temporal patterns of isotopes across the Juneau Icefield will allow for a deeper understanding of the local relationship between these tracers and climate. This understanding is critical to interpreting water isotopes as a proxy for climate changes in the past. MASS BALANCE: Dr. Shad O'Neel, Kate Bollen, Olivia Truax, Evan Koncewicz, Tai Rovzar and Alex Burkhart present the mass balance team's 2016 research. Abstract: The Juneau Icefield Research Program has collected mass balance data over the last 70 years on the Taku and Lemon Creek glaciers. We analyze data from 2004-2016 to investigate the interannual variability in the accumulation gradients of these two glaciers from ground penetrating radar (GPR), probing, and snow pits. 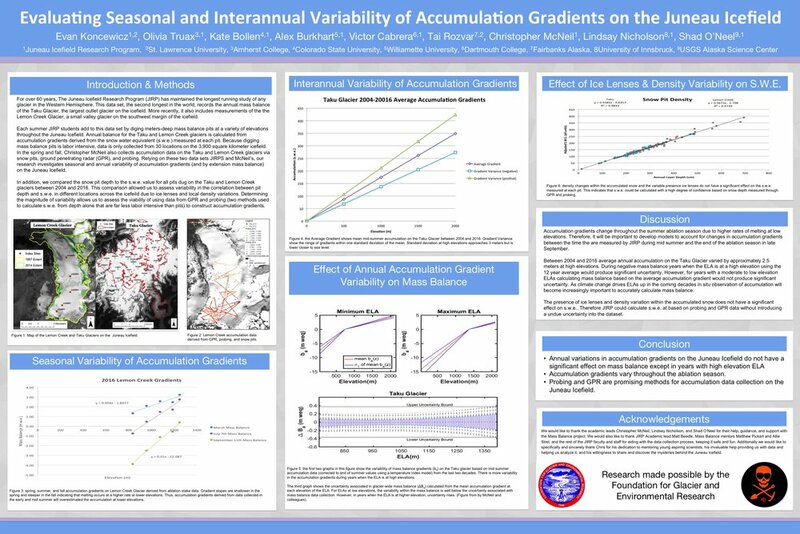 Understanding interannual variability of accumulation gradients on the Juneau Icefield will help us to interpret its long-term mass balance record. The Lemon Creek Glacier is a small valley glacier on the southwest edge of the Icefield. GPR data was collected over the glacier surface in March 2015 and 2016. In July of 2014 and 2016, the accumulation area was probed for snow depth, and two snow pits were dug for snow depth and density. The accumulation gradients resulting from each method are compared between years to assess the interannnual variability of the accumulation gradient and the resulting glacier wide mass balance. The Taku Glacier is the largest outlet glacier on the Juneau Icefield. We use three snow pits dug each year along the longitudinal profile of the glacier between ~1000m and ~1115m, the region that typically reflects the ELA. In 2004, 2005, 2010, 2011, and 2016, snow probing was continued in the central region of the Taku and the resulting gradients are compared to each other and to the gradients derived from the snow pits. We assess the resulting impact on glacier wide mass balance furthering our understanding of the state of these two well-monitored glaciers on the Juneau Icefield. PLANNING FOR 2017: We are excited to build upon these research efforts and also expand in new and exciting research directions. Stay tuned for more information on our 2017 season in the coming weeks! A portion of the JIRP crew at the 2016 AGU Fall Meeting gathers for dinner after a day of science in San Francisco. Six members of the Juneau Icefield Research Program set out to take the annual GPS (global positioning system) measurements of one of the few glaciers advancing in the Northern Hemisphere. The movement of Taku Glacier has gone through many changes in history. Currently, the Taku Glacier is acting as a land-terminating glacier because it is pushing into land known as Oozy Flats. About 120 years ago it was a tidewater glacier, since its tongue was flowing into the inlet as opposed to land. Since Oozy Flats is only a small patch of land, Taku Glacier could end up being a tidewater glacier again. The lower reaches of the glacier can be considered a “piedmont lobe”, resulting from the fact that it flows out of its constraining valley into a broader, less constricted area where it spreads out to fill the broad mudflat (much the way molasses would flow across a plate). To track the movement of glaciers, scientists rely on data taken from satellites, airplanes, and people on the ground. What's the reason for three different data sets? To triple check! Six JIRPers participated in tracking the Taku Glacier on the ground this year. Our goal was to use survey-quality GPS to map the position of the glacier’s extent to see if the tongue is still moving forward into the land and, if so, at what speed. To speed up the survey work, the team divided into two groups. The first was lead by Scott McGee, JIRP’s field logistics manager, the second by Uwe Hofmann, a staff representative from Beuth University of Applied Sciences in Berlin. For several years, Beuth University has supported JIRP with surveying equipment and provided opportunities for German students to travel to Alaska – a great cultural exchange opportunity. Each leader took two students, to form the Taku West and the Taku East surveying teams. Scott, Brooke and Salvatore headed to the west, while Uwe, Pat and Sarah took the east path. Both groups walked along the terminus (the furthest extent of the glacier ice) taking GPS coordinates at regular intervals. With the approximate center of the glacier as our starting point, we headed out into the Martian-like landscape of the Taku Glacier terminus. Fighting knee deep mud, frigid glacier streams and bushwhacking that would make a grizzly bear cry, we worked our way around approximately 60% of the 9.2km total perimeter distance of the glacier's broad terminus. In previous years, wide meandering streams stopped teams from covering more ground, a problem we hoped to solve by bringing a small inflatable boat. When we reached the banks of the marginal rivers, our progress ground to a halt as we looked out across large, very fast turbid rivers – far too fast for our Gilligan-sized ship. So much for our dingy. To get around this obstacle, we had to improvise, as is often the case with field work. In order to bypass these inconveniently placed streams, we had to climb nearly 1000 feet up glacier, navigating several crevasse fields before descending back down to the glacier’s edge to continue our survey. The results of our survey are shown in the figure below, with 2012’s results also shown for comparison. In the figure, the terminus position (the furthest extent of visible ice) in 2012 is shown as black lines, and the 2013 extent as red lines. Right off the bat, we see that the glacier has advanced about ¼ kilometer (800 feet) since the aerial photographs of the base map were taken in 1998. Second, we can see that the glacier terminus has advanced a further 10 to 30 meters (35–100 feet) over most of its perimeter during the past year. This advance isn’t uniform, as is demonstrated by the seven insets in the figure, described in the figure caption. The terminus shows no sign of stopping its advance, much to the dismay of the trees, shrubs and wildlife that call Oozy Flats home. It is likely that if this glacier continues to advance, it will someday again be a tidewater glacier as it continues to advance towards the Taku River.